We booked this cruise because of the itinerary. It was a 14 day mostly southern Caribbean Cruise. 2 sea days out of Miami and two sea days coming back at the end with 8 stops in between and 5 of those were places we had never been to. The stops were all mostly great, except for 2 I would not go back to/ Riviera is a larger size ship in the Oceania line up but still pretty small in comparison to other cruise liners (approx. 1,200 passengers at capacity I believe although it was not at capacity on our cruise). 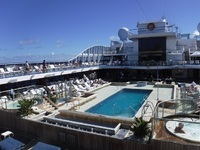 Layout of the ship was good and the pool on the Lido deck is quite large compared to others I&apos;ve experienced. 4 specialty eateries plus the Grand Dinning Room and of course the buffet give you lots of dinning options. The food was very good overall but I found the selection in the dinning room at dinner not much to my liking. The specialty places were better as was the buffet; surprisingly. We ate breakfast and lunch in the Waves Cafe which is a covered but open deck area on the Lido deck. It was faster and not as busy as the buffet, The buffet had more food options but the cafe was suitable for our needs. There was also a great ice cream place there where you could get milk shakes and well as ice cream in cones or in a dish, Smoothies were served there in the morning. Cabin and balcony were pretty standard although you could not fit an empty suitcase under the bed for storage, which is a first for us, You had to open them and lay flat to get them under the beds (very strange). The bathroom was the great part. Full tub with shower PLUS a stand alone shower as well with actual glass door rather then just a shower curtain! That set up was great! It&apos;s an older crowd you&apos;ll be sailing with so leave the kids and teens at home - they won&apos;t have much company if you take them along. We prefer sailing on small ships as you get to meet more people it seems, particularly if you choose to share a table at dinner in any of the eateries. One thing that I though was odd were the vibrations I could feel at certain spots on the ship. In the Grand Dinning Room (stern of the ship) and in the Waves Grill/Cafe (mid-ship) there was a noticeable and annoying vibration. I have not noticed that on any ship I have sailed on in the past. Overall, a very nice experience as service was excellent in all aspects of the cruise. Entertainment was good at times and poor at other times but that depends on your likes and dislikes I suppose. Riviera is a larger size ship in the Oceania line up but still pretty small in comparison to other cruise liners (approx. 1,200 passengers at capacity I believe although it was not at capacity on our cruise). Layout of the ship was good and the pool on the Lido deck is quite large compared to others I&apos;ve experienced. 4 specialty eateries plus the Grand Dinning Room and of course the buffet give you lots of dinning options. The food was very good overall but I found the selection in the dinning room at dinner not much to my liking. The specialty places were better as was the buffet; surprisingly. We ate breakfast and lunch in the Waves Cafe which is a covered but open deck area on the Lido deck. It was faster and not as busy as the buffet, The buffet had more food options but the cafe was suitable for our needs. There was also a great ice cream place there where you could get milk shakes and well as ice cream in cones or in a dish, Smoothies were served there in the morning. Cabin and balcony were pretty standard although you could not fit an empty suitcase under the bed for storage, which is a first for us, You had to open them and lay flat to get them under the beds (very strange). The bathroom was the great part. Full tub with shower PLUS a stand alone shower as well with actual glass door rather then just a shower curtain! That set up was great! It&apos;s an older crowd you&apos;ll be sailing with so leave the kids and teens at home - they won&apos;t have much company if you take them along. We prefer sailing on small ships as you get to meet more people it seems, particularly if you choose to share a table at dinner in any of the eateries. One thing that I though was odd were the vibrations I could feel at certain spots on the ship. In the Grand Dinning Room (stern of the ship) and in the Waves Grill/Cafe (mid-ship) there was a noticeable and annoying vibration. I have not noticed that on any ship I have sailed on in the past. Overall, a very nice experience as service was excellent in all aspects of the cruise. Entertainment was good at times and poor at other times but that depends on your likes and dislikes I suppose. Decent cabin arrangements with an average balcony, Bathroom was superior with a full bath.shower and a stand alone shower plus sink and toilet, Only complaint was we could not fit our empty suitcases under the bed for storage - never had that happen on any other cruise line. Not a good experience. Beach was not great, vendors were rude and unwilling to take anything but Euros for goods or even food and drink. Just a bad experience all round - avoid this one!